Don’t want to miss Velocity but can’t find the time or the budget for four days of intense action? We want to make sure everyone who's part of the DevOps and cloud native communities has a chance to attend Velocity—including you. The Expo Plus pass is an inexpensive way for you to attend all keynotes, sponsored sessions, and sessions in the Expo Hall. You can also network with peers at evening events and other casual discussion spaces at the conference and of course, learn about the latest products and services at the Expo Hall. In addition to visiting with sponsors, you'll be able to test drive new tools, compare products, meet with nonprofit volunteers, say hello to speakers and authors, hang out in the lounge, and much more. Ignite: Join us for a fun, high-energy evening of five-minute talks—all aspiring to live up to the Ignite motto: Enlighten us, but make it quick. Velocity Dine-Around: Looking for dinner plans Tuesday night? Sign up to join a group of fellow attendees for the Velocity Dine-Around. 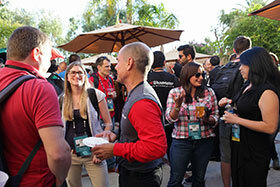 Expo Hall Reception: Enjoy drinks and food while networking with other attendees and sponsors. The hallway track: Velocity's hallways have been the birthplace of many ideas and collaborations. The hallway track, as we like to call it, is one of the best parts of Velocity. Speed Networking: Get to know fellow attendees in quick 60-second discussions. Speed networking will be held Wednesday and Thursday morning before keynotes. O'Reilly Author Book Signings: Meet O'Reilly authors and speakers in the O'Reilly booth on Wednesday and Thursday. 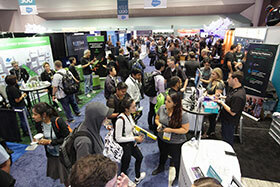 Meet the Experts: Meet with Velocity presenters in a small group setting on Wednesday and Thursday. Seating is limited. Register now—only 100 passes available! Note: Does not include access to lunch, training courses, tutorials or sessions (EXCEPT for sponsored presentations). Standard discounts do not apply.